While it seems half the nation is buried under mounds of snow or are experiencing deep freezes, we have been having unseasonably beautiful weather this past month that makes it hard to believe it is already March. The snow has been melting like crazy and I can actually see my lawn. The kids are really hoping to catch a leprechaun this year or at least find a “lucky surprise” left behind for them on the lawn this St. Patrick’s Day. 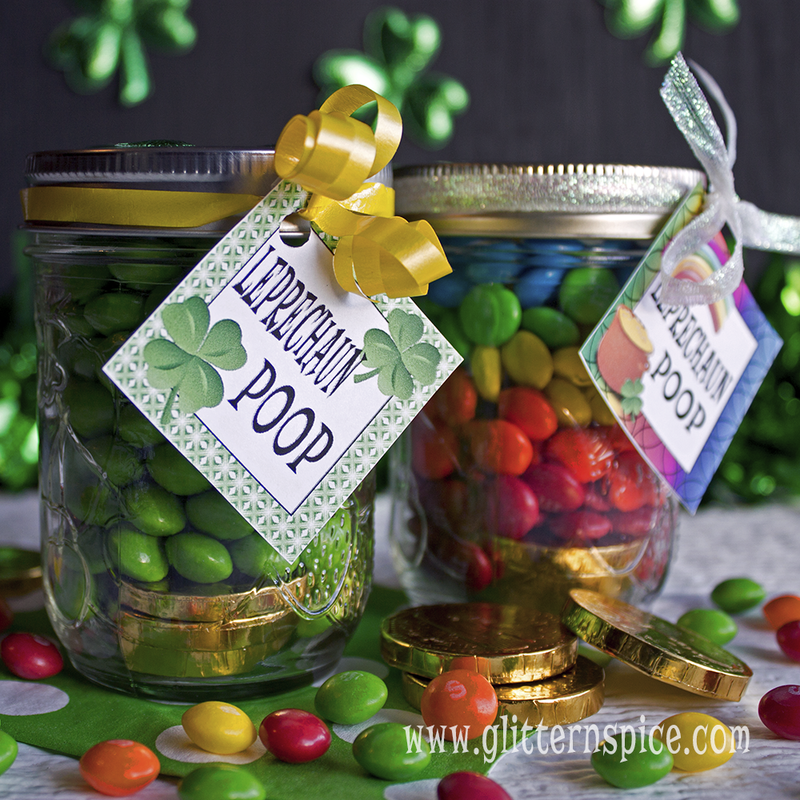 I made these silly St. Patrick’s Day Leprechaun Poop Mason Jar Gifts for the kids just in case the sprightly leprechauns evade my children’s carefully constructed leprechaun traps. 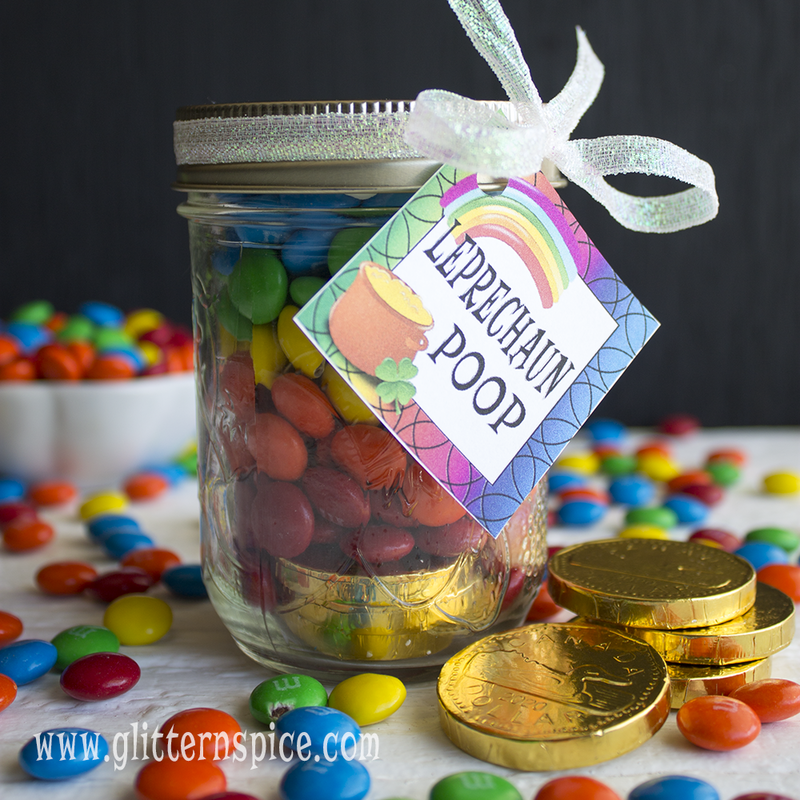 Fill jars or treat bags with colored candies and chocolate gold coins and attach a gift tag to make cute leprechaun poop treats that will delight children and adults alike. I picked up a bag of family sized Skittles candy from Amazon and picked all the green ones out to make these leprechaun treats for my kids. You could also use a bag of green M & M’s or any green candy really. I added a handful of chocolate gold coins to the bottoms of the jars. I used half pint mason jars and 4 inch treat bags to make these leprechaun treats, though any sized jar or bag would work too. I used a piece of bright yellow ribbon to attach the gift tags to the jars and stapled the bag toppers to the tops of the bags. 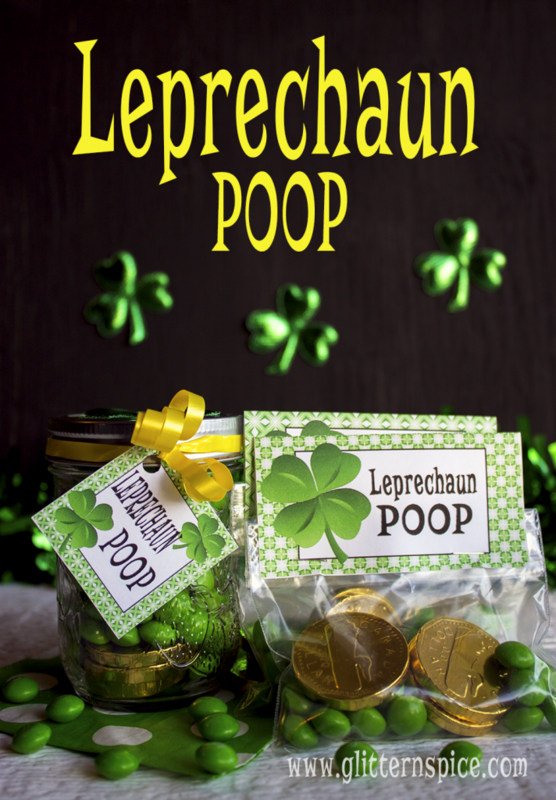 Contrary to popular beliefs, leprechaun poop isn’t always green. Sometimes the lucky leprechauns poop rainbows and gold too! You can get the instructions for making these colorful jars of rainbows by following my Rainbow In A Jar Tutorial I posted a few weeks ago. 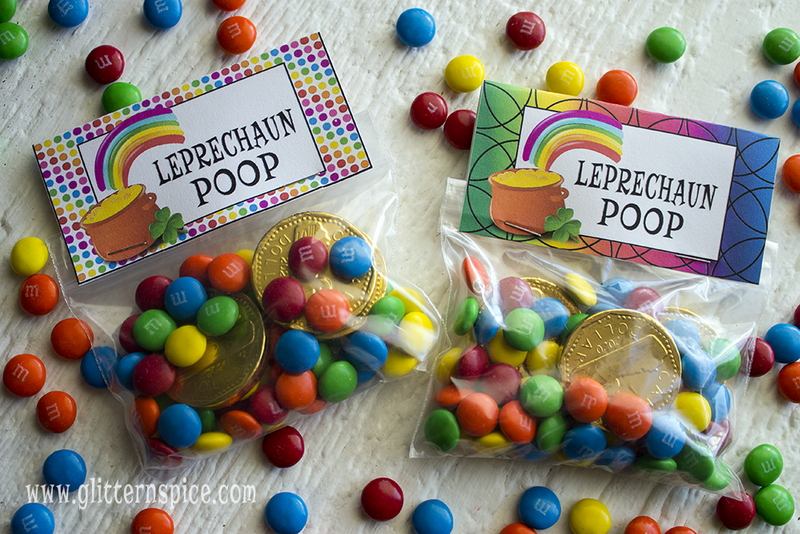 Fill treat bags with rainbow-colored M & M chocolate candies or Skittles and chocolate gold coins to make rainbow leprechaun poop. 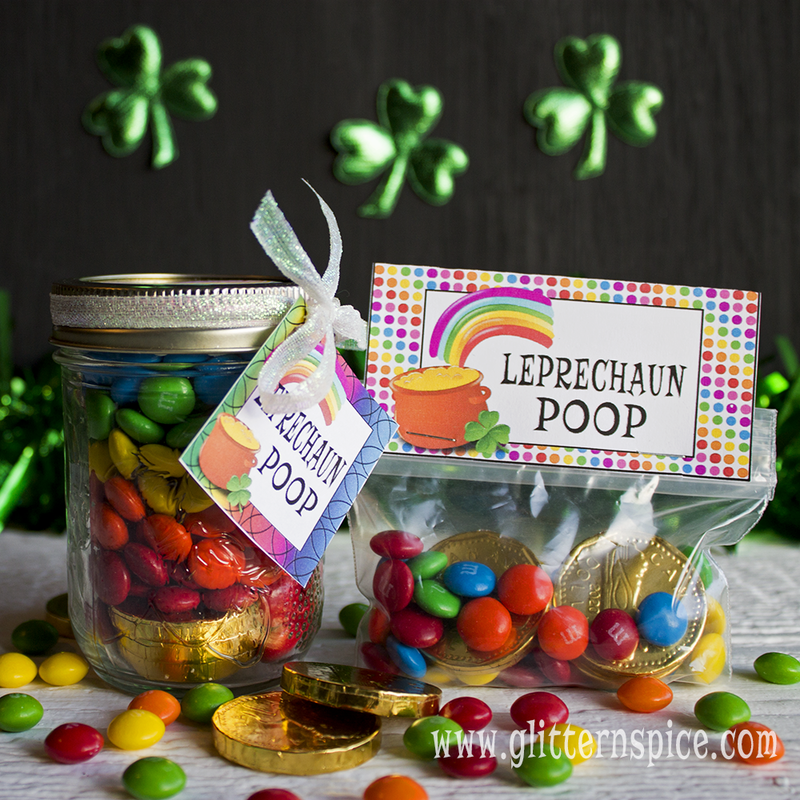 The leprechaun poop treat bags are a cute and silly gift idea for school party or as party favors for a March birthday party. 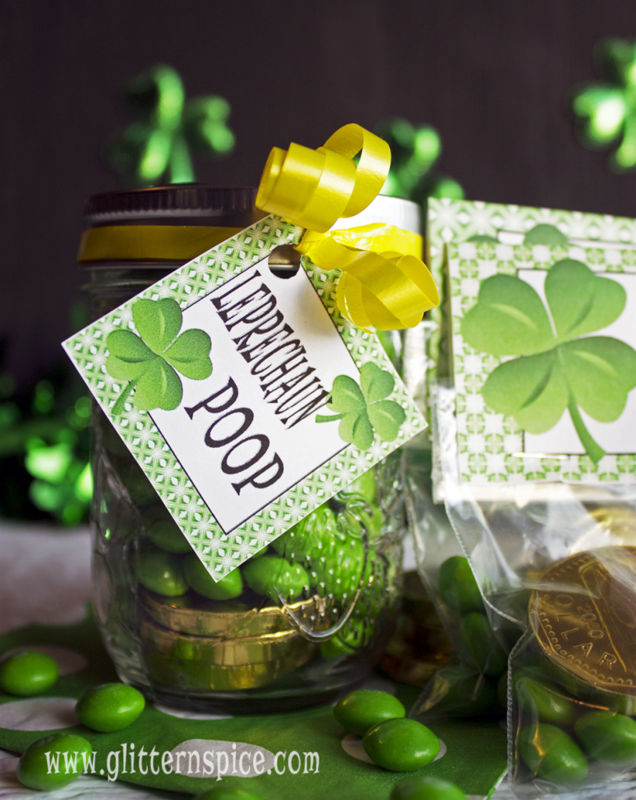 The jars of leprechaun poop and gold make cute gifts for teachers, grandparents, caregivers and children. 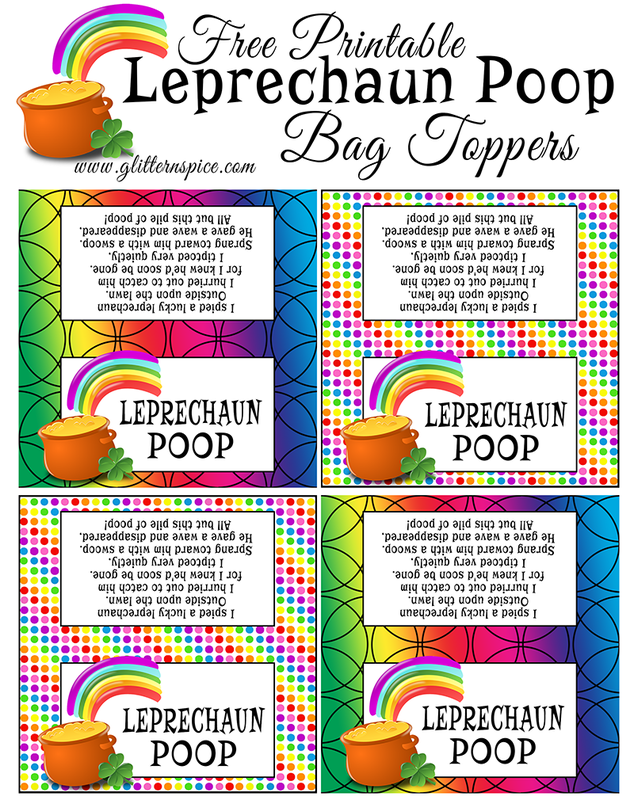 Here are three free leprechaun poop printables I made which you are welcome to use. Just click on the download link underneath each printable to open the images in high-resolution which are hosted on google docs. Click the print icon and under the margins heading, select none to remove the margins. This will allow the image to be printed using the full width of the paper. 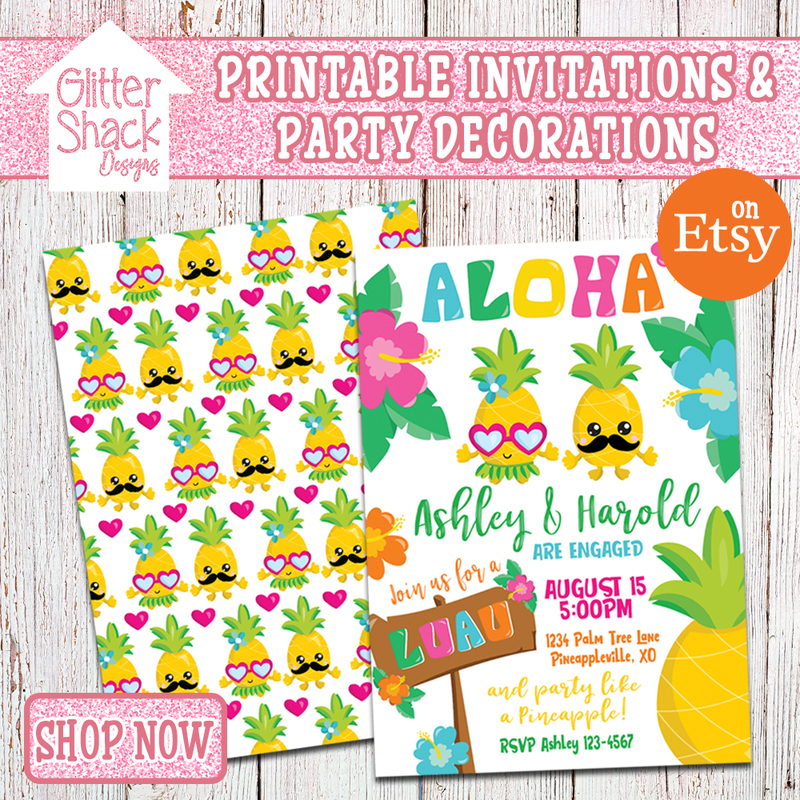 These printables are for personal use only and you are not allowed to use them for commercial purposes. 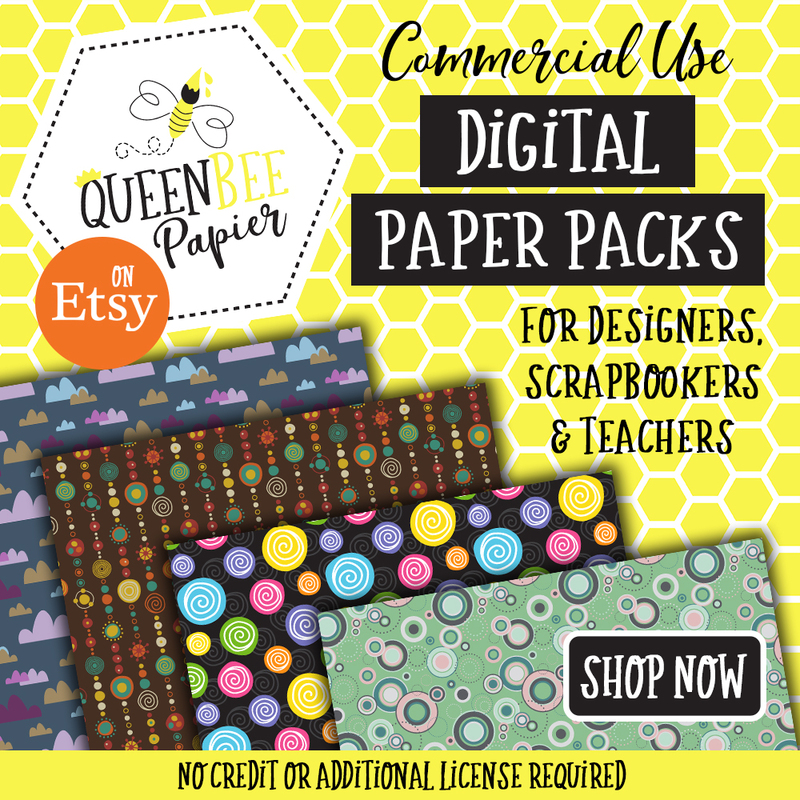 Please provide a link back to this page if you use these printables in any project posted online. Thank you! 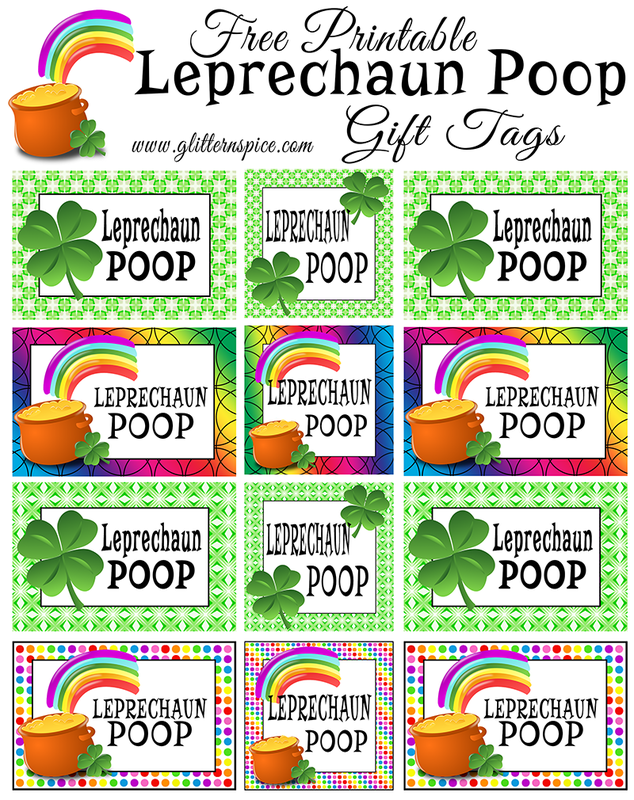 There are two different sizes, 3″ x 2″ and 2″ x 2″, and four different designs of free printable leprechaun poop gift tags included on this sheet. There are two green themed designs and two rainbow themed designs. You can use these gifts tags on mason jars or treat bags. 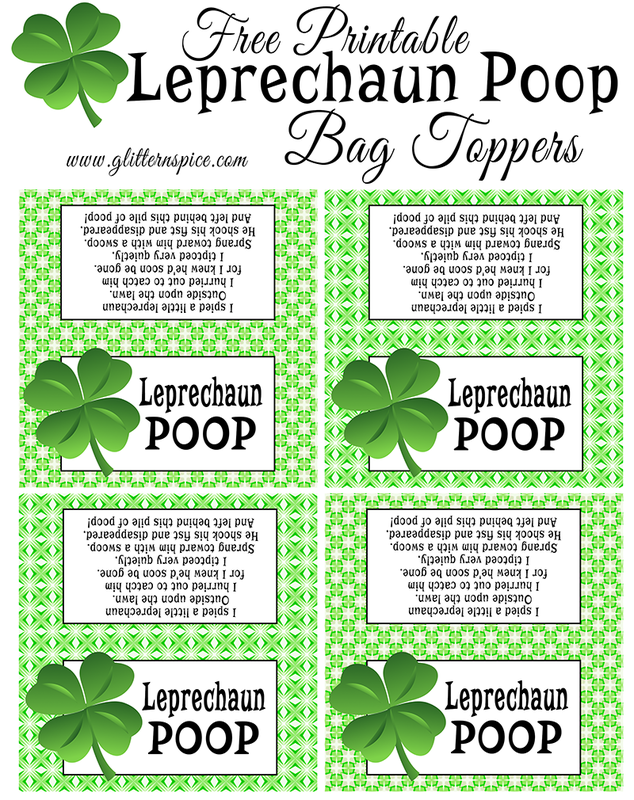 The free printable leprechaun poop treat bag toppers each measure 4 inches wide by 2 inches high. 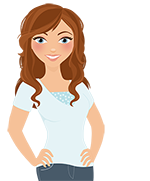 If you would like to use these on snack sized baggies, cut the toppers in half and mat on a 6″ x 3″ piece of cardstock. 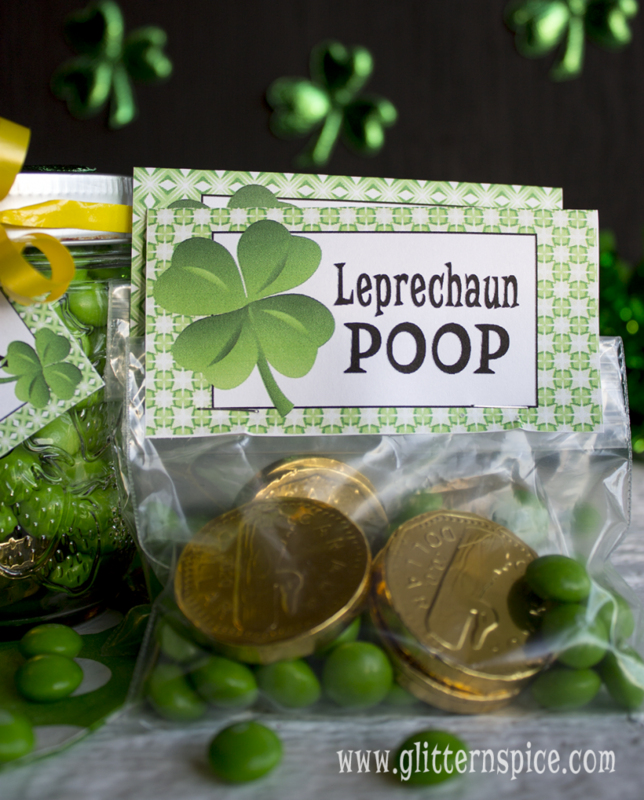 Each of the bag toppers includes one of two leprechaun poop poems. In the first poem, the leprechaun shakes his fist and in the second poem, the leprechaun gives a wave before leaving a pile of lucky leprechaun poop. And left behind this pile of poop! And but this pile of poop! Happy St. Patrick’s Day! May The Luck Of The Irish Be With You!